A little girl meets a friendly dragon at the beach and invites him to tea and lunch. During lunch the dragon sneezes fire and the table and curtains catch on fire. The fire alarm goes off but the little girl knows the important rules of fire safety. She tells the dragon that they must not stay inside and must meet their mother outside by the tree. When the dragon tries to go back in for his teddy bear, the little girl tells him to never to go back insidde a burning building. The little girls mother calls for help and the fire men come and put out the fire. Everyone is safe which is really important. The next time that they want to have tea, the friends will have a picnic on the beach. 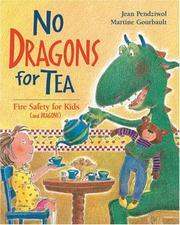 Pendziwol, Jean//Gourbault, Martine, “No dragons for tea: Fire safety for kids (and dragons),” Children's Picture Book Database at Miami University, accessed April 18, 2019, https://dlp.lib.miamioh.edu/picturebook/items/show/9677.